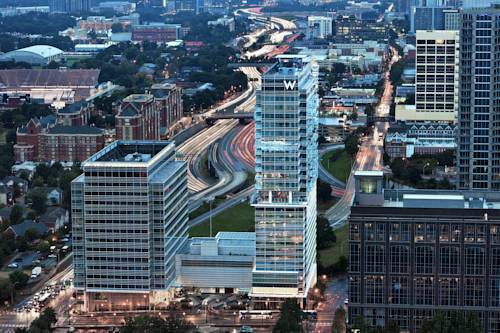 In Atlantas exciting downtown, the W is a lush hideaway infused with natural elements and sensual style, where revitalization and rejuvenation beckon amid major corporations, specialty shopping, upscale living and everything cool about Hotlanta.Going south is now in season all year round. Cozy up in our Living Room or succumb to indulgences at BLT Steak and DRINKSHOP. Whisk away from our private heliport or wind down at luxurious Bliss Spa. Workout at FIT. Come play in style.Southern charm meets modern living is everything you've dreamed of the signature W bed, High Speed Internet Access, lovely Bliss amenities, fabulous entertainment, delightful W MixBar, and Whatever/Whenever service that makes wishes come true. Atlanta is burning the city is hot on cool, a whirlwind wonderland of exhilarating arts, sizzling nightlife, sensational shopping and dynamic dining, no more Gone With The Wind, all capital of the hip New South. Downtown Atlanta is movin' on up, boldly buzzing as home to a host of Fortune 500 corporate headquarters and world-class academic institutions where work and play happily coexist in a cheerful consortium of commercialism and culture.And boy, do they play. Because big is always better in the South, there's always more to explore: the 70,500-seat Georgia Dome, home to the Atlanta Hawks, Falcons and championships like the Super Bowl and NCCA athletics; the five-million-gallon Georgia Aquarium; the Atlanta Braves' 14 consecutive postseason appearances; Centennial Olympic Park, a tribute to 100 years of global sportsmanship; countless major art, science, nature and archaeology museums; and important Civil Right monuments at almost every corner. Oh, there's more a hip-hopping R&B scene, a vibrant theater and dance community, a presidential library, Stone Mountain Park, a regional theme park and championship golf just a tee away.All this where streets filled with dogwood and azalea trees are accented by soft Southern drawls, where business sense is powered by gracious hospitality, where luxurious boutique shopping complements independent bohemian storefronts and BBQ, grits and fried chicken are just as at home as sushi, steak tartare and hummus. As long as you're goin' South, why not mix business with pleasure? Escape to Atlanta s only all-weather rooftop pool bar. Sip after you dip around the partially-covered zero-edge pool and soak up panoramic city views with a signature cocktail. Where do you lounge? Enter the Living Room, where we've knocked down the walls of traditional lobby design to create a place where you can open your mind and feel alive while indulging in salon socializing. Savor W Kitchen s innovative American cuisine scratch made from local and seasonal ingredients. - Marsh and McLennan Companies, Inc.
- Apartment Realty Advisors Of Georgia Inc.
- Hodges Ward Elliott Inc.